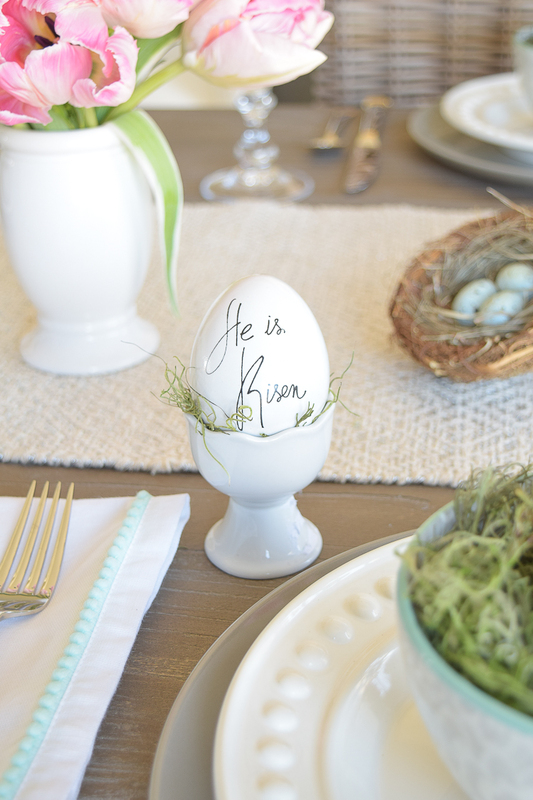 Like so many of you, we celebrate Easter in our home to honor our resurrected Savior. It’s a time when everything is new, lush, green, and in a lot of cases bright and colorful. These are all reminders for us that there is much hope in the newness of spring and what the Easter holiday truly stands for. And although Easter is a joyous time for us in our home, it can sometimes be a somber holiday as well because we live so far from family. 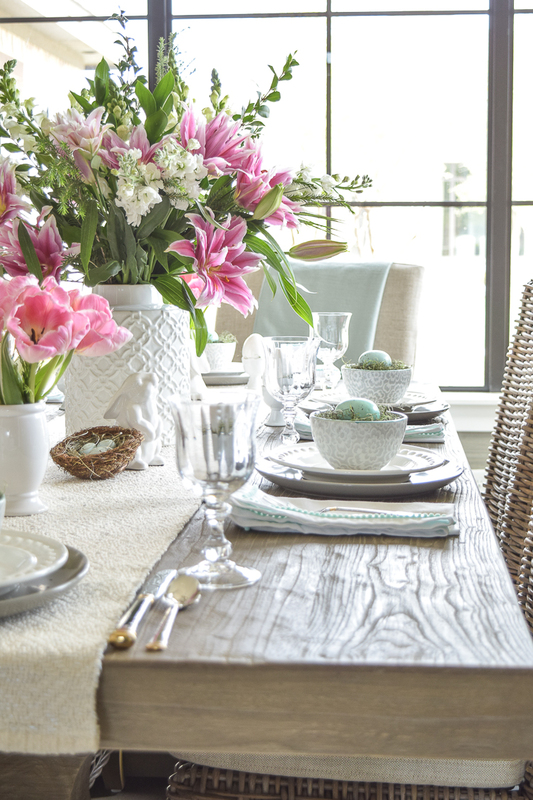 We usually save trips home to visit our loved ones for the Thanksgiving and/or Christmas holidays so usually on Easter it’s just us and we typically go out to a nice Easter brunch after church or, stay in for a cozy meal with just our little family. So, we’ve decided that since we have gone out for the past couple of years we will stay in this year and I’ve been playing with my table scape, and of course had to share it with you. For this year’s table I really wanted to just let the flowers dictate the route I would take but additionally I wanted it to be less formal and a little more cozy so I pulled in some of our every day dishes and combined them to come up with a place setting that doesn’t feel overly stuffy and has that casual elegant feel I enjoy. These darling bowls were from West Elm a few years back and my heart literally just skips a beat evert time I see them! 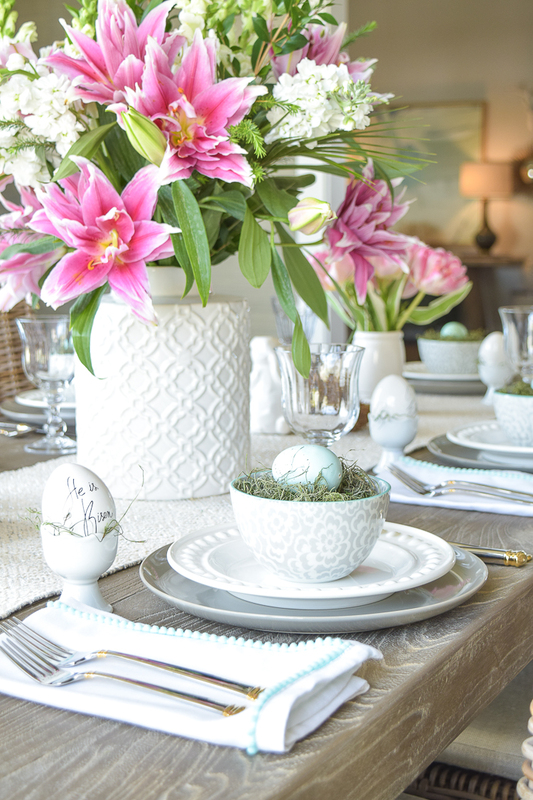 We enjoy using them so much every single day and I was super excited to be able to pull some of my favorite pieces into my Easter table this year. 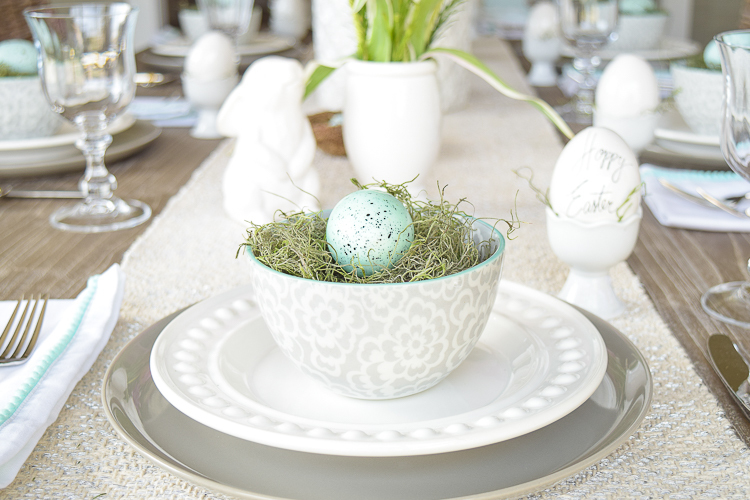 And of course to dress things up a bit, I added the moss and the speckled eggs that you can find at just about any craft store this time of year. And here is a tour around the rest of our table. 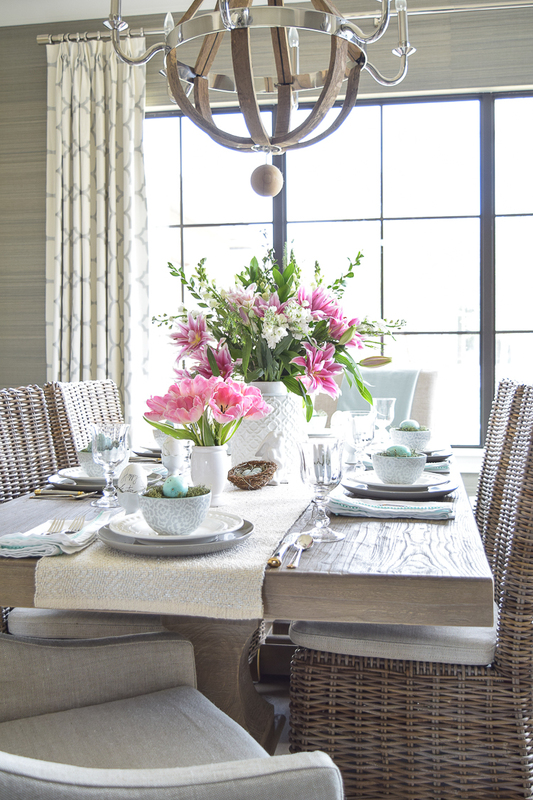 I sure hope you enjoy it and are able to take some inspiration from it for your own table this year. The gray dishes I’ve had for years from Crate & Barrel and the white dishes were a recent find at HomeGoods (but you can find some similar ones here) and I’ve combined all of that with my formal flatware and these darling beaded napkins from HomeGoods. I love repeating patterns (I’ve talked more about the benefit of repeating patterns in design here) and love that my napkins and white plates have the same beaded pattern. The crystal is Lenox and was found at HomeGoods as well. 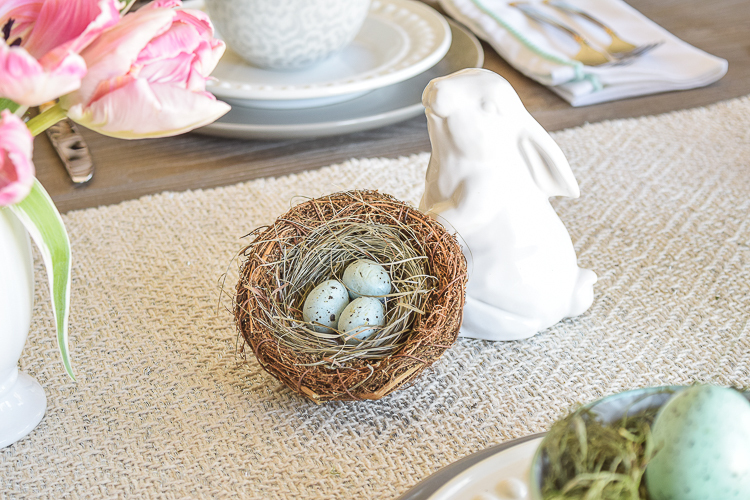 The table runner is from West Elm but is no longer available, but I’ve sourced a similar one for you here. 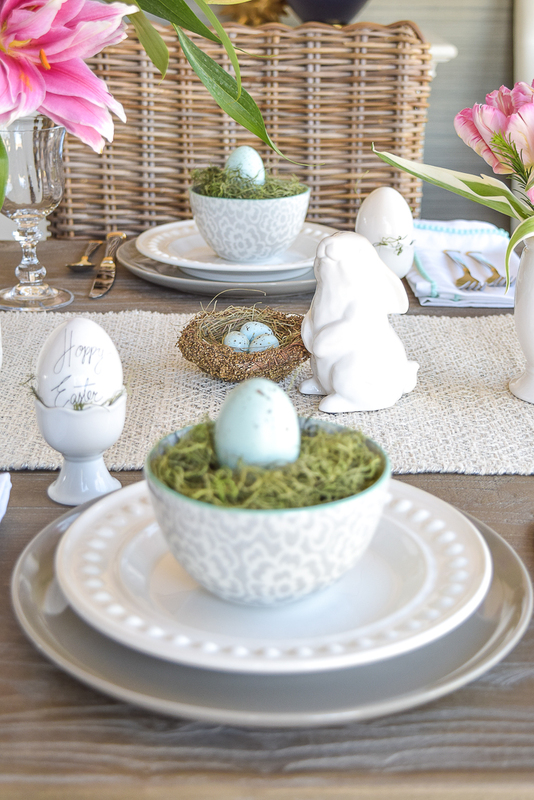 Some of my favorite things for this year’s table are these precious little white bunnies, ceramic eggs, and the nests, which goes without saying. 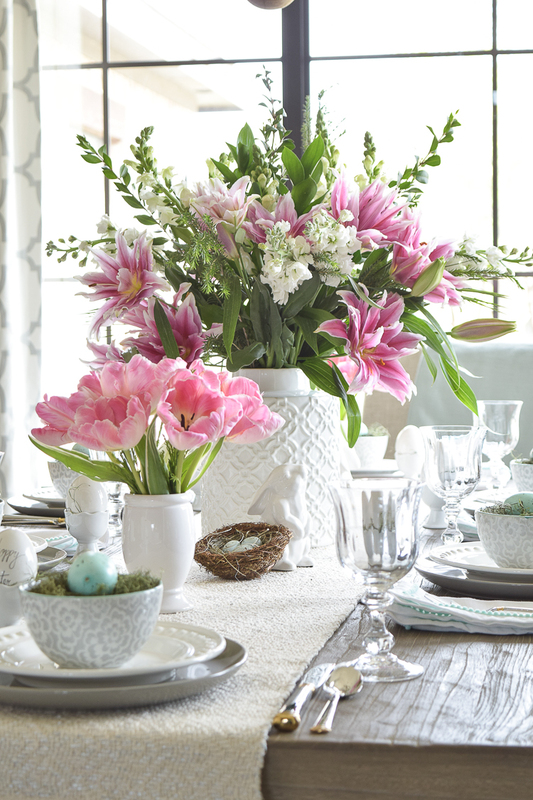 Of course we all know that Easter isn’t about bunnies and bird’s nest but these are the symbols we use in decor to signify spring has arrived and that everything is fresh and new again, just like the true story Easter provides to those of us that have been saved through faith in our Lord and Savior Jesus Christ! So, of course I had to add some to my casual elegant table this year. The Egg holders (which are so darling with their scalloped edge) are no longer available on line but you can find some similar ones here. The nests and bunnies I found at my local Market but you can find similar nests here, and bunnies here. By now everything is on sale so you are in luck if you are in need of any of these items for next year!! My next favorite things are the flower choices I made for this year’s table. 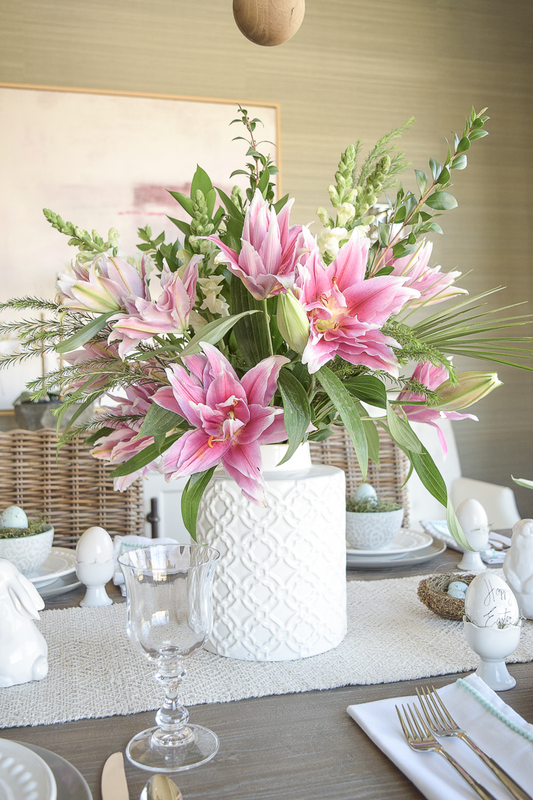 I had planned on using all white flowers with just a hint of color but when I saw these pink stargazer lilies I just couldn’t resist. I even left the store and came back to get them because I couldn’t get them out of my mind. They are so stunning in person (I wish you could see and smell them because they are heavenly!). Of course I had to mix in a market greenery bunch and some white flowers so I chose snap dragons for my white flowers. 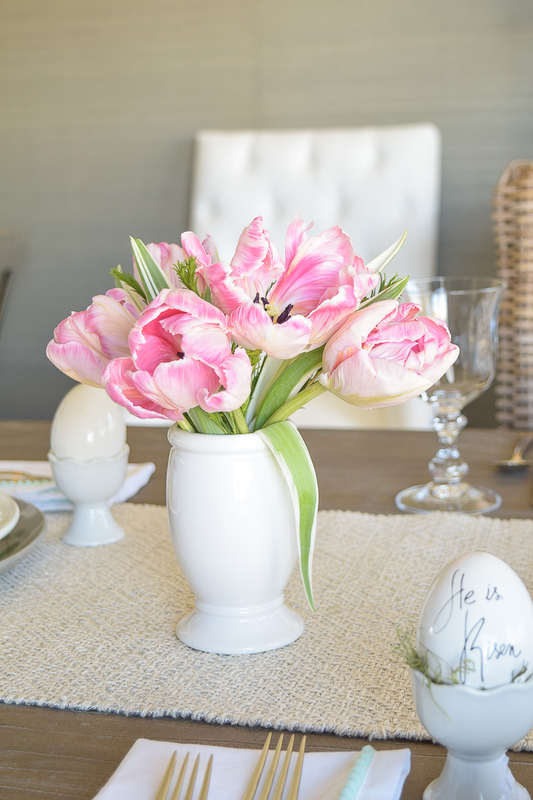 These soft pink tulips also really spoke to me for my table scape this year as well! 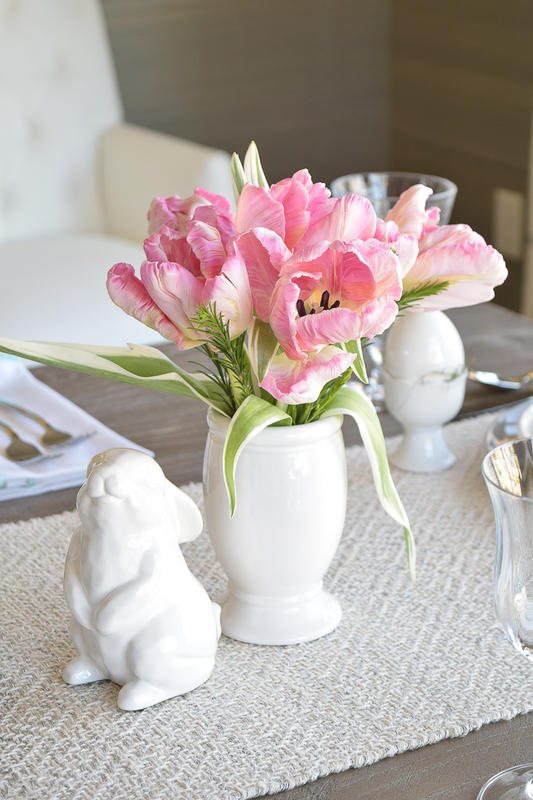 And, I pulled out some old water cups that we used to use in our master bathroom to use as a vase for the tulips since they were just the perfect shade of white and, the perfect style for this table. And speaking of that, I love it when you can repurpose an item like this for something totally different than what it was intended for. I believe I bought these cups years ago at HomeGoods in the bath department so I love that I can now use them as a vase for beautiful tulips like these, and for such a special occasion. For my centerpiece flowers I pulled out a vessel I often use around the house for faux flowers (found here). 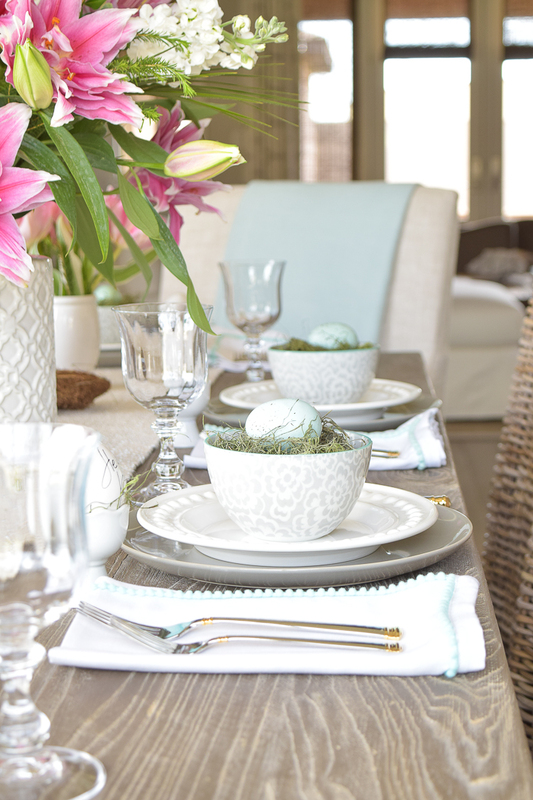 I love the pattern that adorns it and found it to be the perfect piece for our table this year. And did I mention that actually my favorite part of the center piece flowers are the two small palm branches I included, once again as a subtle reminder of the true story of Easter. Hi Debi! Thanks so much for stopping by the blog and for the sweet, sweet comments hon!! I am checking into the glitch you were telling me about but it might be because you were already subscribed. I’ll let you know what I find out! Hugs and I sure miss you:)!! Thank you so much, Jennifer! And I am so happy to be linked up to you as well! Have a blessed holiday and thanks for all of the photography tips that made this post so great!! Bree, your photography is beautiful!!! Love everything! So pretty! Have a blessed holiday! Every single bit and detail is perfect! 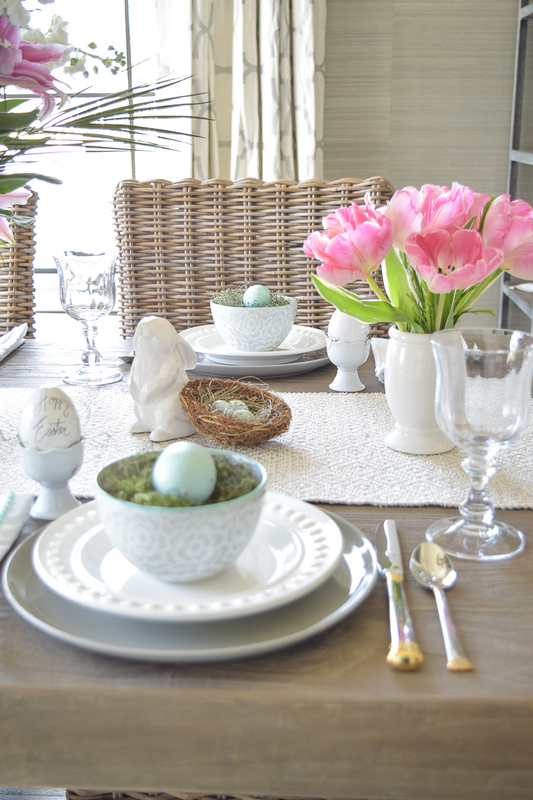 Love the eggs, love the nests, love the bunnies, love the flowers! I imagine your menu will be just as spectacular, but a PB&J would even look great on your ‘scape. 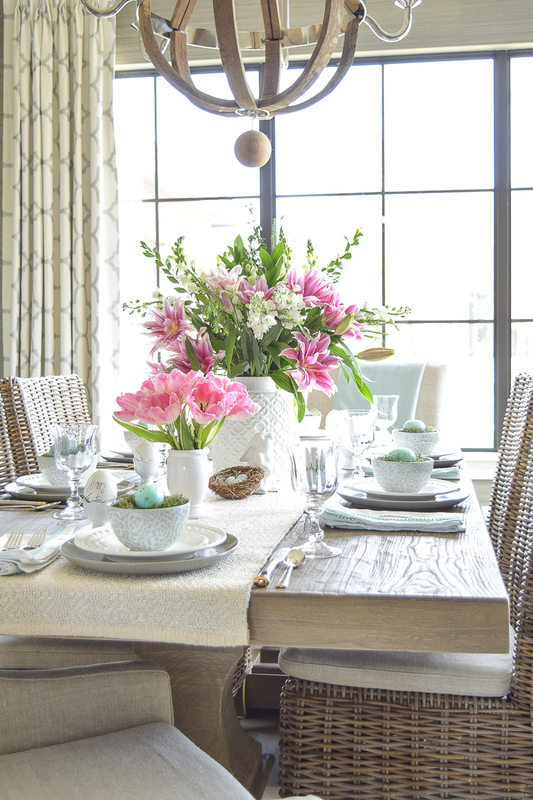 Hope you have a beautiful Easter! Looks amazing Bree! 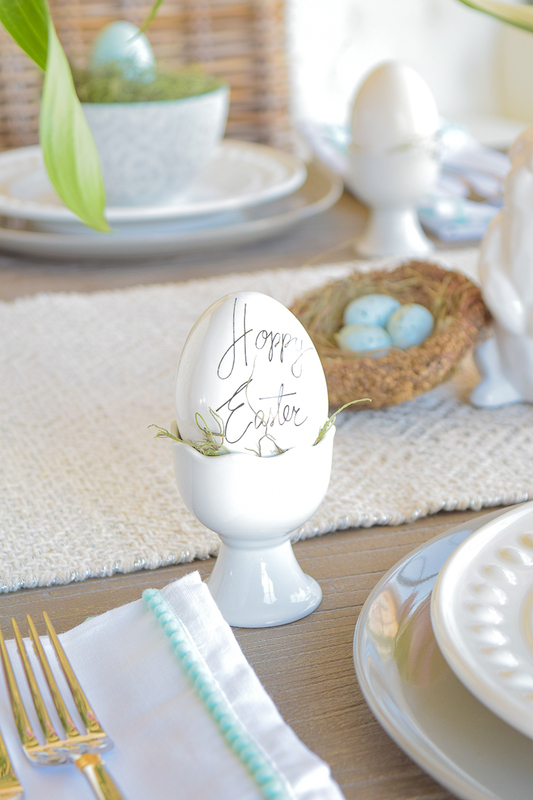 I LOVE, LOVE, LOVE the handwritten ceramic eggs. Such a fabulous idea. Thank you so much for stopping by the blog, Tana! And I’m so glad you like everything, especially those eggs:) I had a great teacher so no wonder you like everything (wink, wink:). Can’t wait to hang out soon!! Hugs! 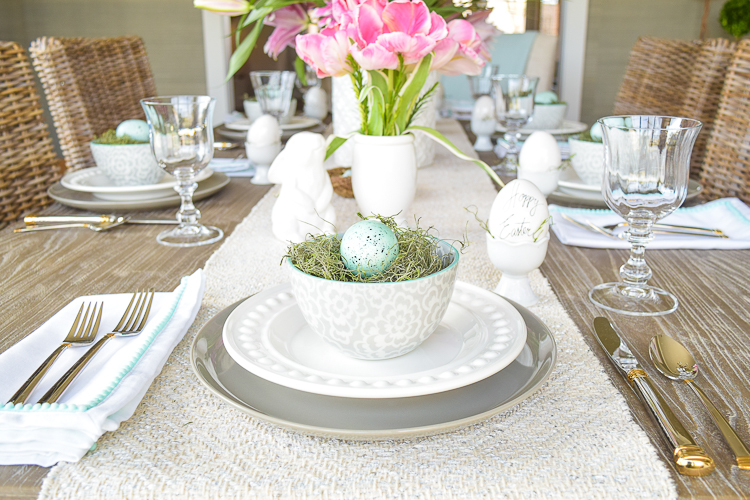 What a fresh, fun and fabulous table setting! 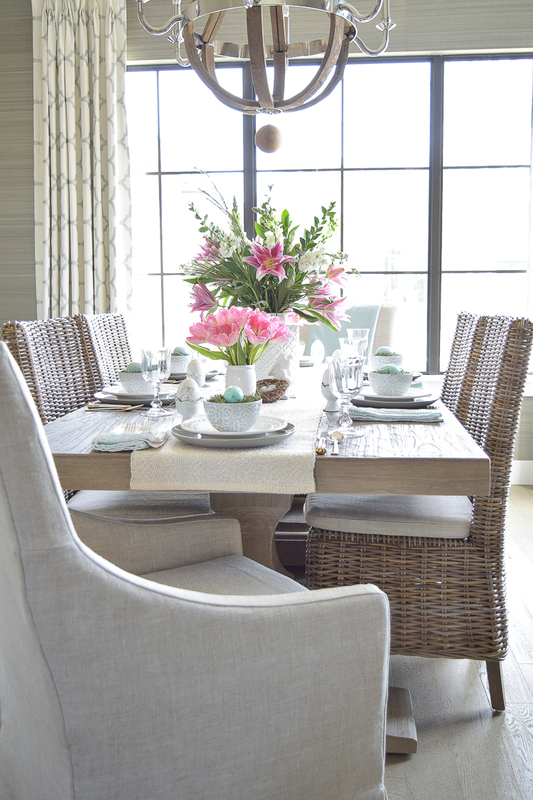 Your dining room is stunning, Bree. 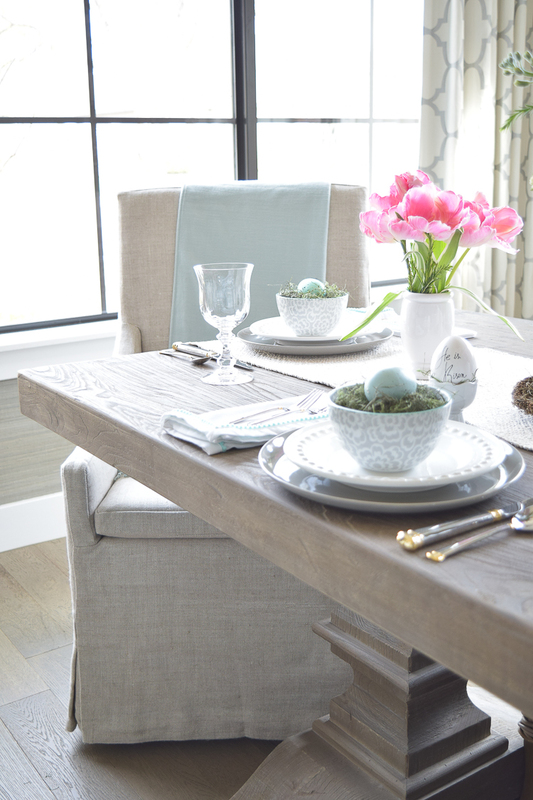 I hope you and your family enjoyed a lovely Easter.